Walking around Somerville over the years, I occasionally encountered the words NOT ART painted in stencil block letters on buildings, signs or objects around the city, and I began seeing them in neighboring Cambridge as well. I asked around to see if anyone knew the identity of the artist or artists, but no one seemed to have any information on who he, she, or they were. Throughout the videotaped interview, the artist wears a mask made from what appears to be a cardboard produce box (perhaps maintaining his anonymity to avoid being charged for unauthorized graffiti). He explained that the purpose of his work was to encourage viewers to see the beauty in the ordinary objects on which NOT ART was painted. Given that many of the ones I photographed are in or around construction sites, IMHO the artist may also have been commenting on the disturbing pace of development and gentrification in Somerville and Cambridge. Or maybe he was simply choosing to paint on surfaces no one was likely to get upset about because they were temporary. The video included a number of NOT ART images I had not seen before, while those I photographed and am including here do not appear in the news story, so whoever made them was quite prolific. I hardly ever encounter them these days, so maybe the mystery artist has moved on, artistically or geographically. 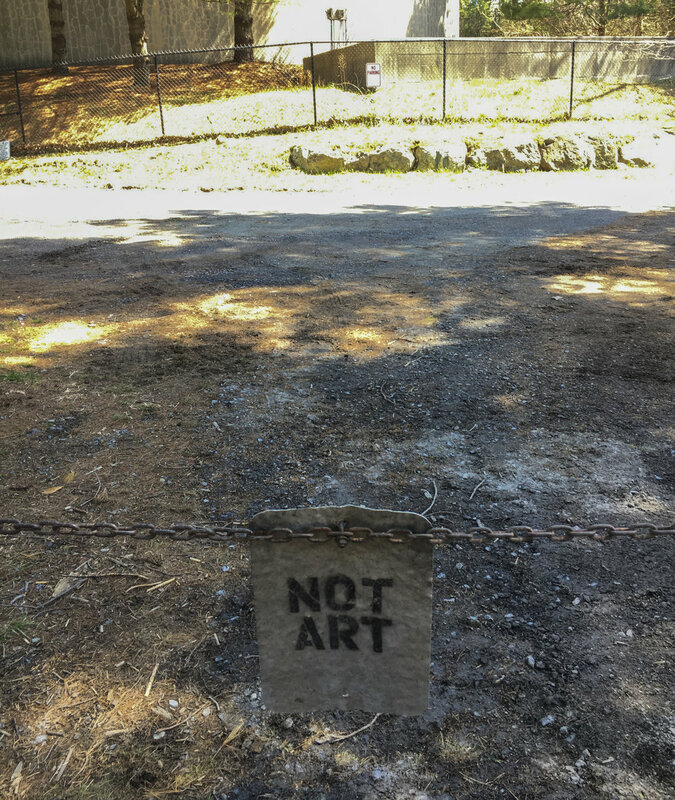 In the one below, the artist has refrained from using the word NOT. Does this mean this one is ART? 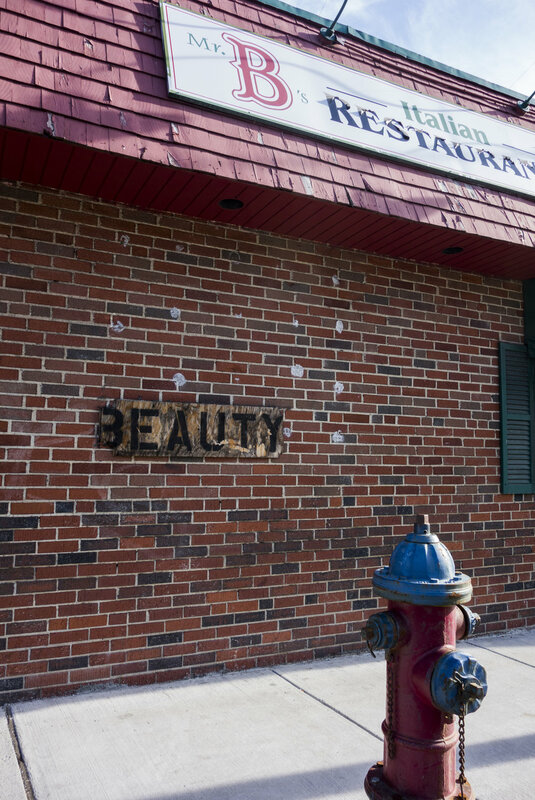 Below: this Somerville BEAUTY has the same stencil-style block letter aesthetic as NOT ART. Is it just a different way of conveying the idea of finding beauty in ordinary surfaces? A different artist? The one below is another Somerville outlier: similar black stencil-style lettering, but a different concept: the lettering and plain white background invite passers-by to take a photo, which would add a human figure to the image. Needless to say, I could not resist the invitation, and snapped a photo of a friend who was walking with me, but in the spirit of maintaining this photo essay’s aesthetic consistency (no humans), I’m not including it. And finally, there’s this one, which I encountered quite unexpectedly, on Cape Cod, in the Falmouth/Mashpee area. Someone has affixed, after the NOT, the letters ICE, which dovetails with the stated intentions of masked Somerville artist who says he wants people to NOTICE his work, The smaller sized letters that are glued rather than painted on the sign, suggest the ICE was added later (or the result of poor planning).